Here in DSM, it is our responsibility in every possible way to limit uncertainties and to keep your business running smoothly. So we created protection for every sources that DSM currently supports. It depends on the protection option you will select in the Settings on how DSM will treat your listings if it goes under protection mode. Amazon Prime items is eligible for free 2-Day shipping but once Amazon change it due to special shipping characteristics, DSM will automatically put it on protection mode. If the item is not sold by Walmart, DSM will automatically place it under protection mode and even you tried to list items like this, DSM will not you to list it. DSM also provides protection for AliExpress items and it works on which shipping company you will use, if the shipping company you use is ePacket for your listings and suddenly once of your listings change the shipping company from its source, the listing will be under protection. This protection for Kmart and Sears items is the same with Walmart that if the item sells by a 3rd Party Supplier and Kmart and Sears, the item will be put under protection mode. 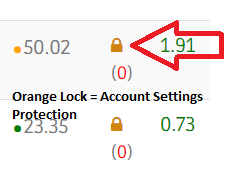 You can identify an item that is under "Account Settings Protection" by the orange lock next to the destinations quantity in the Price Monitor page. Orange lock would be activated when item goes into "Account Settings Protection"